Hey there! I’m sharing an old post with you because there are so many new readers! This is one of my favorite projects ever. It was the first thing I ever built and has made keeping all of my tools and painting supplies so easy! Happy building! 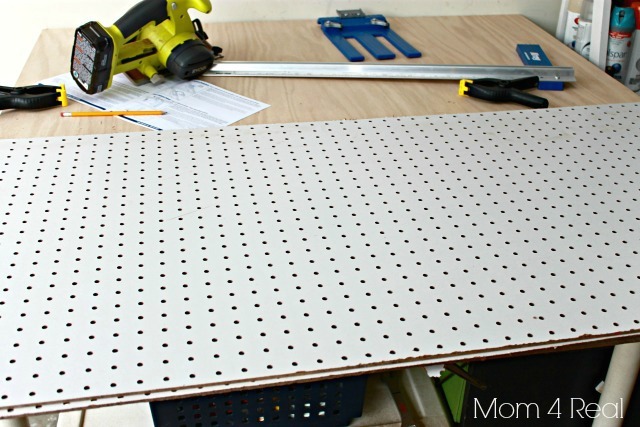 I started with one large piece of pegboard which was 96″ X 48″. I had my peg board cut it in half for me so I could fit it in the back of my truck, then cut each piece in half with my super awesome new Ryobi circular saw myself when I got home. 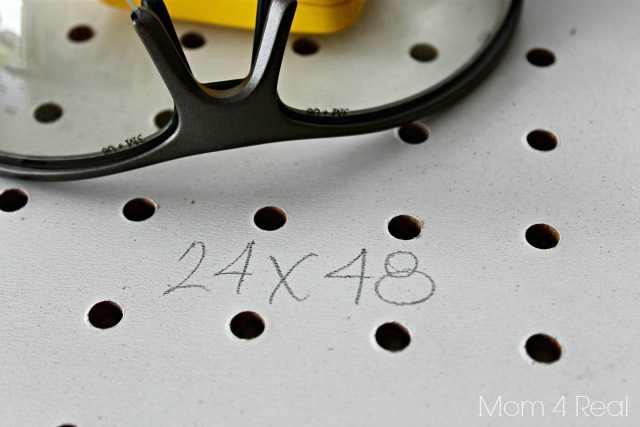 So I now had 4 pieces of pegboard…each 24 inches wide and 48 inches tall. I bought two pieces of 2X2 and cut them in half so I had four pieces that were 48 inches tall, using my Ryobi Miter Saw! 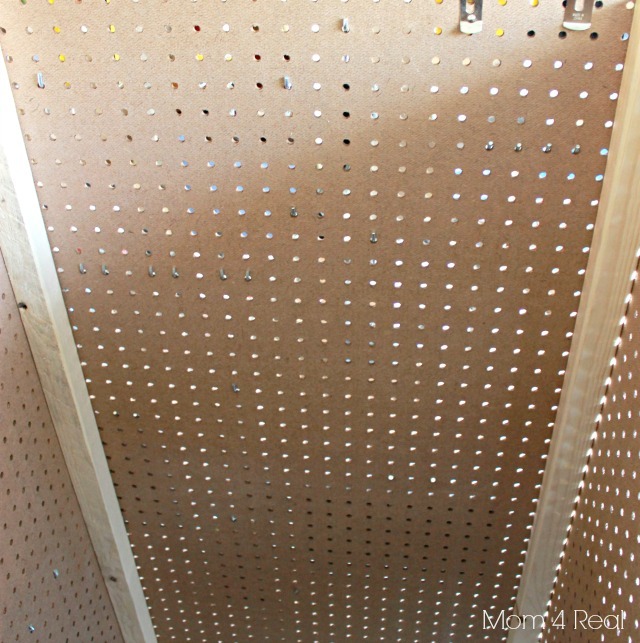 I then placed a long bead of wood glue from top to bottom on two of the 2X2 boards and placed one of the pieces of pegboard on top to make a wall panel. 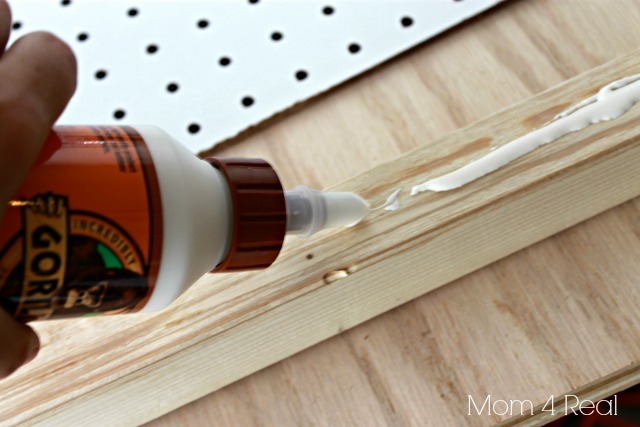 You don’t necessarily need the wood glue, but I want mine to be really strong. Next, I secured them with four screws…one at the top, one at the bottom, and two spaced evenly between those. I repeated this process until I had all of the walls screwed together. They make a nice cube like structure. To finish it off, I turned it upside down and added some casters that I already had to each corner. 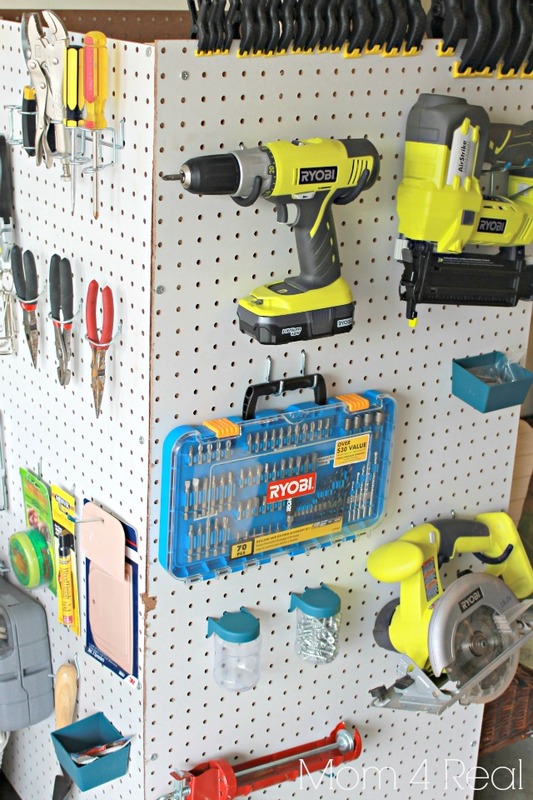 I added hooks and pegboard containers to each panel and hung all of my tools and accessories. This caddy allowed me to keep all of my supplies in one spot. I even have an entire side where I can keep all of my painting supplies! I love being able to grab my safety glasses and whichever tool I need without making a mess, and I can just pull them with me. If I am working outside, I just roll this baby out with me. If I’m painting on the other side of the garage, I can just take it over there! Now I am ready to get started, and can’t wait to learn to use all of these fabulous Ryobi tools together!!! Are you going to build with me??? Oh..my Heck Jess- YOU DID IT!!!! Big Girl Tools! :) Looks great- totally Jealous! What a great idea! 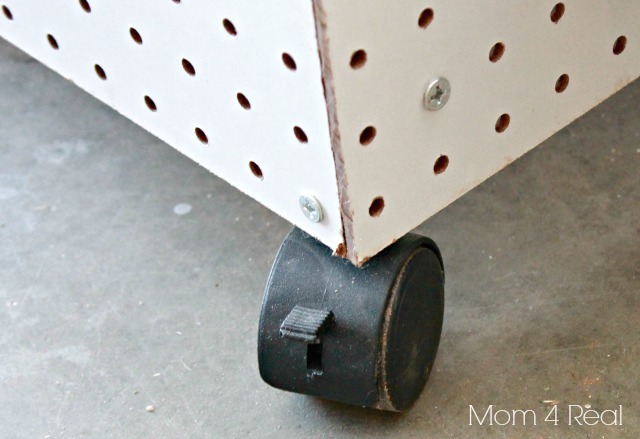 You are smart to put casters on the bottom, I have a wonderful workshop, but no tools. I am saving for them. And a real camera. Who needs to eat? So great!!! I would love to have this as I am always traipsing all over my garage to get what I need. Such a great idea! Ahhh!!! That is so cool. I love it girl. A place for everything. Makes it sooo much nicer to work when you know where everything is. Cleaning up is easier too. It’s awesome Jessica! Can’t wait to see what you make next. #toolpower :) WHOO! girl, i just love this idea. brilliant! sharing in my weekly wow’s on friday! You are a total genius! I can’t find any of our tools half the time! This set up makes total sense! I’m so impressed! Love, love , love it!!!!!! I love this idea! So compact and versatile. I had an idea; what about adding a power strip to the bottom to attach to an extension cord wherever one works? That’s a fantastic idea, Donna! I may just do that!!! Holy crap this is BRILLIANT!!! We totally need to do this for our spare room. 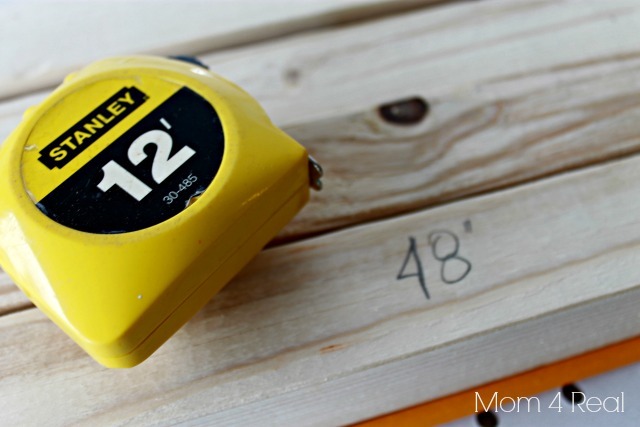 You may have just solved one of the biggest storage issues in our home! I have been trying to figure out a good solution forever — thank you!! Jessica this is a great storage solution!! We just had a 12 x 20 building built on our property to use as a workshop and this rolling storage would be the perfect solution for our tools and supplies. It would keep us from having to walk back and forth to get tools. Thanks for sharing!! I have spent hours looking for the movable pegboard tool storage rack that I once downloaded from the Internet (It looks like a pole tent when completed). The problem is, it requires welding for a metal frame, and I only downloaded the picture, not the instructions. 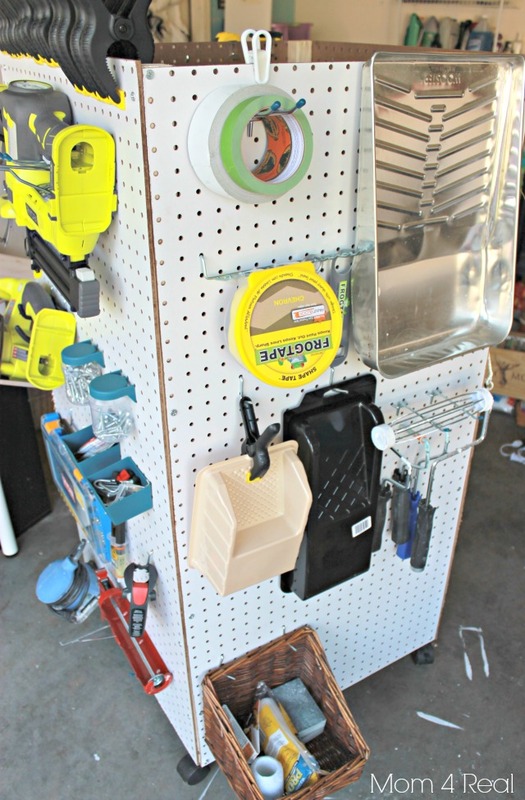 Anyway, while looking for this item, I have downloaded three or four sets of instructions for making pegboard racks that do not require any welding, but this one may be the l one I use; it’s certainly the easiest to build, whether I chose the tent pole design or yours. Sure, it’s design is obvious, but if it’s so obvious, why have I wasted al of this time looking for a that elusive design that I first saw? No, I give you full credit for this. I might have done exactly the same thing, BUT I DIDN’T. VERY cool!! Love how portable and just logistically awesome this is, Jessica. Oh my goodness!! That is incredible Jessica!!! Jessica, this is such an awesome idea!! We just got the keys to our very own paint studio and I’m so going to make one of these!! Thanks for sharing!! WOW! That’s great. I need one of those. Great idea! I will definitely do this for my garage! The only thing that I would change is to make use of all of that inside space. I would leave one side off (you could still add cross-bars for support. Then I would add tracks so I could slide bins into the middle. Thanks for the great ideas! I came across your idea on Pinterest. I got all the supplies and my four kids, ages 10 – 15, made it by themselves! It was a Christmas gift for their Dad. He LOVED it and was dually impressed! I used the “hobby boards” already cut at 2′ x 4′. The only difference we made was that I had a piece of plywood cut (again, a 2’x4′ “hobby board”) into two pieces. We used one piece for the base so that the wheels would be really sturdy. We marked the other piece with the outline of the bottom of a 5 gallon paint bucket and cut out the whole and nailed it to the top. Now, our 5 gallon bucket sits down in the hole up to the rim and holds extension cords. Thank you so much for being so clever – and for sharing with the rest of us! I love this project, how clever! 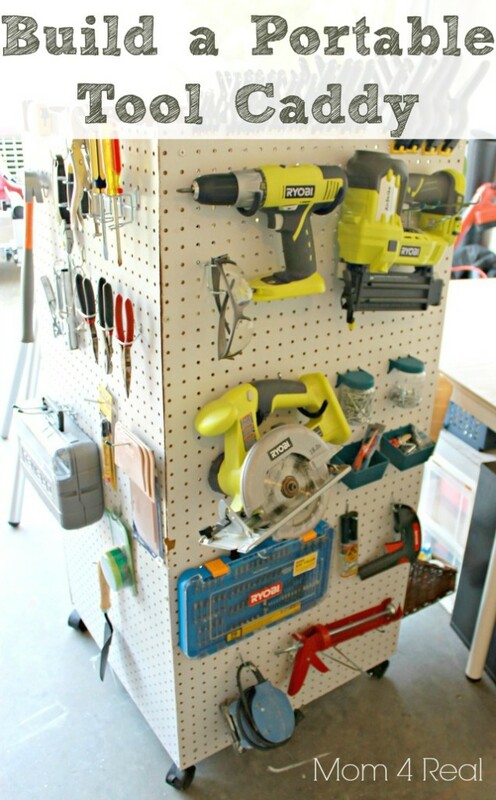 I’m getting ready to clean out my tool shed and I may need to make something similar! Thanks for the inspiration! WOW.. 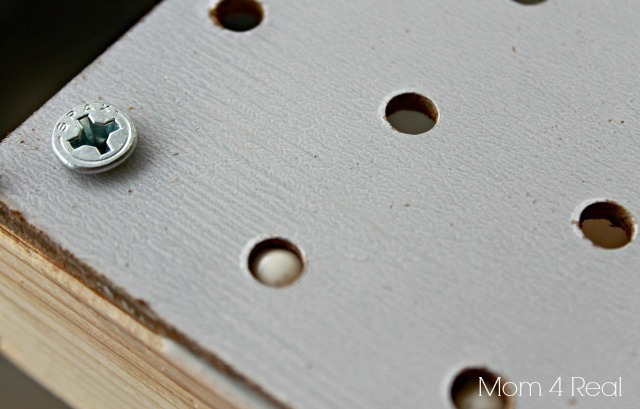 I love this idea.. Super handy and easy to make! Do you have handles on it for pushing and pullong it? Is it heavy? I don’t, but it’s super light and glides around with ease. I came across your pin on Ryobi Tools. 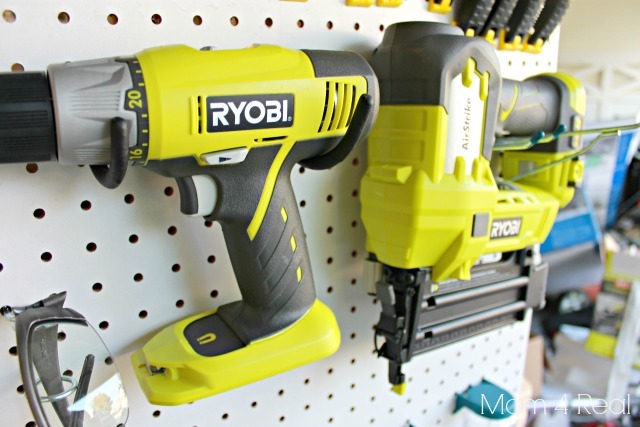 I need to get my garage organized as I just bought my first Ryobi Tools – circular saw, brad nailer and drill/driver set. And I have yet to use them and the circular saw seems very intimidating. But going to make this my first project. Thanks for sharing. This idea is absolutely genius! My husband has woodworking tools scattered all over our basement, and I’m constantly trying to keep them orderly but accessible. Definitely going to give this portable storage unit a try!! Thanks Jessica! I was going thru this and thinking, wouldn’t it be just awesome if you put hinges and a handle on one of these sides, and put shelves on the inside??? Too cool! Thank you so much for the ideas!!! I will be building one with the shelving inside for my next home (tiny condo with tinier detached garage) and I will need all the space and storage that I can get! Especially after living in this HUGE home! And yes, it will be a huge transformation that I am NOT looking forward to! We actually ended up adding shelves inside later on after so many people suggested it. Good luck in your new home, and send me a pic if you build it! I will send a pic, but it will be sometime in 2019 when we move in. We already have the condo (retirement home) but for now, we are just renting it out. Thank you so much for posting this! I made 1 like this! I added a top for a work space/bench & a door for access to all the usable space on the inside. Love it! Awesome idea!